Today was our first full day with no travel so we made the most of it. We all had a great sleep in our comfortably cool room and Asher was in a good mood for his morning story time. We set out early to find some bananas to compliment our oatmeal, raisins and hemp hearts with cinnamon. The breakfast of champions. And best of all, Asher loves it! The 2km walk to the beach was blistering hot with no shade on either side of the street. It is not uncommon for girls to be whistled at while walking about and when we heard a whistle, we thought it was directed at Alyssa. We heard the whistle again but could not locate the origin. After a full 360, we noticed some parrots in the yard and at least one of them was trained to do the “hey good lookin” whistle. 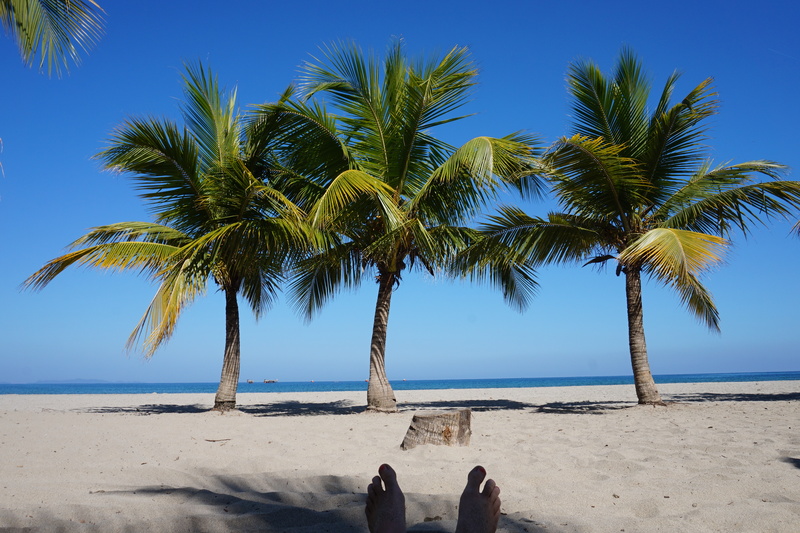 The beach at Tela is highly underrated in guide books and we marveled at the beauty of the monochromatic blues interrupted by lush palms. We forgot the hooks for the hammock so we laid it out on the sand and took turns playing with Asher in the calm lukewarm swells. We were hoping the hammock would keep Asher out of the sand but since it was on the ground, we didn’t last too long at the beach. 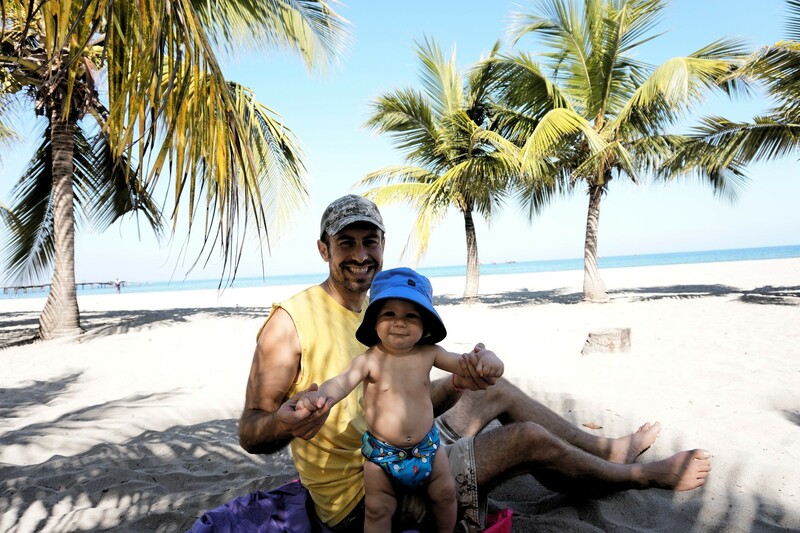 We packed up our gear and explored more of Tela. We managed to get Limpira from the ATM, we bought a large pineapple ($1.25) and ten oranges ($0.40). Latin music was pumping from every store but Asher still managed to catch a cat nap in our Stokke carrier while we dodged the traffic. 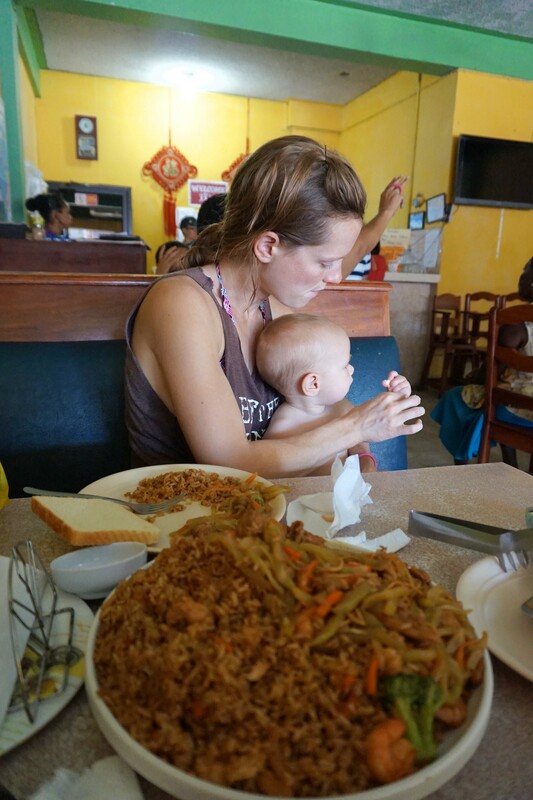 We found our way to the Chinese restaurant and ordered a plate of chop suey and fried rice for two. Our eyes almost popped out of our heads when we saw the heaping plate. Needless to say, we ate chop suey and rice for dinner as well. Andy was happy to see that we ate at his restaurant and all the patrons made sweet smiles to Asher. Meals have been a tad difficult while on the road since we do not have any sort of high chair, bumbo chair or exerscaucer to place him in while we eat. So one of us feeds Asher while the other eats and then we switch. The intense heat of the afternoon forced us inside for a siesta and after a quick cold shower and a few hand washed loads of laundry, we all fell asleep for a much needed nap. 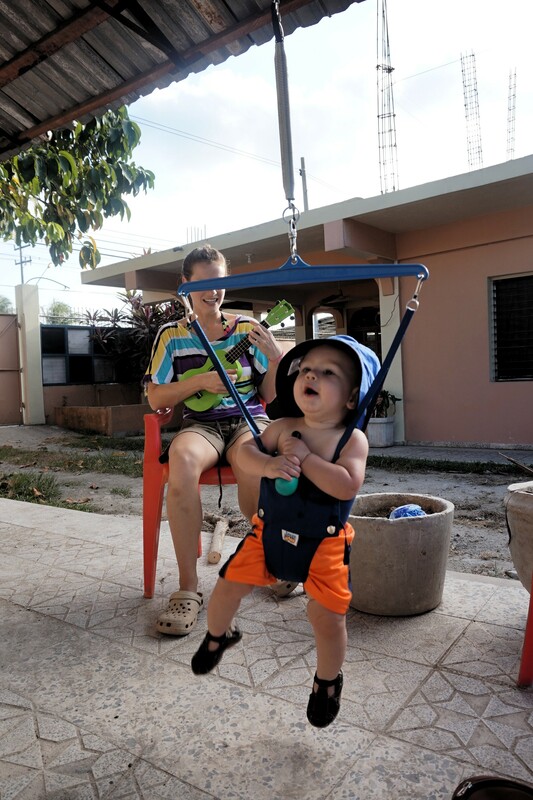 It has been difficult for Asher to get a lot of exercise outside because we do not want him to roll around on the ground. As the sun was setting, we found a place to hang Asher’s Jolly Jumper and he bounced away for a solid hour entertaining the lady doing her laundry and the masons who were working hard nearby. After dinner, we strolled around the back roads of Tela in a comfortable 28C and met many of the locals who were sitting outside enjoying family time. Asher enjoyed his warm bath in his collapsible kitchen sink then fell fast asleep for the night. Alyssa managed to find some time to quietly read and I mingled with Andy and all of his friends and family that he brought by to visit. It was another great day with great people in the picturesque town of Tela. You all are living the dream! Keep at it!! More great stories and pictures! Tela looks so beautiful. 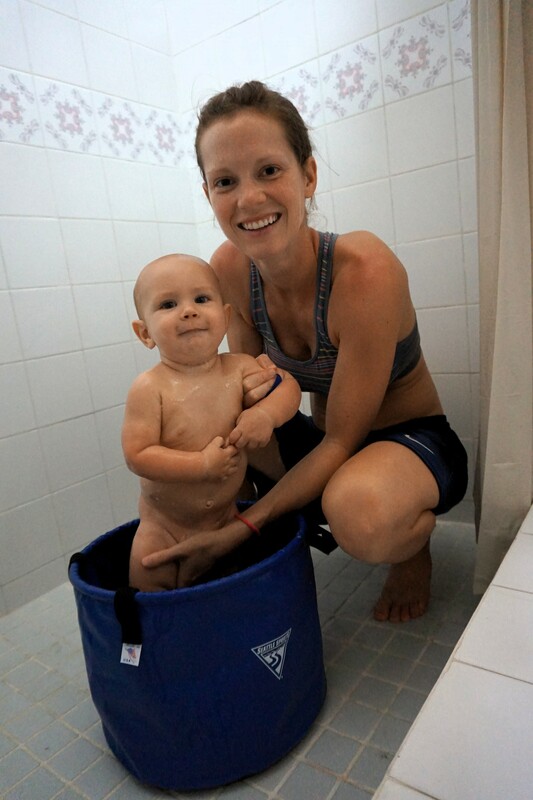 I love the collapsible bath for Asher. Asher looks like he is loving his bath. I am wondering if you are using the luxurious organic bath soap from Aunt Annie. I can just imagine the jolly jumper experience for those who were watching. How amazing that you were able to fit that in your back pack. Love hearing from you. Many hugs. Looks like you guys got the bath in time!! That’s awesome! I Just noticed the book your reading Asher is one of Our kids favorites too! Mikey and Tessa have that book. Another one that Tessa loves is “My Dad Loves Me” (of course), but Team Slees favorite would have to be “I love you forever”. Mom use to read that one to us all the time, Actually Nikki said she woke up the other night to Mom sneaking in our window and started rocking me back and forth singing “I love you for always I like you forever” ! Lol just kidding. But I swear if we didn’t lock our doors I bet mom would still sneak in to rock us to sleep! Haha…too funny. We sing that song to Asher all the time as well. We could only bring about 5 of his favorite books but we read them to him every day. 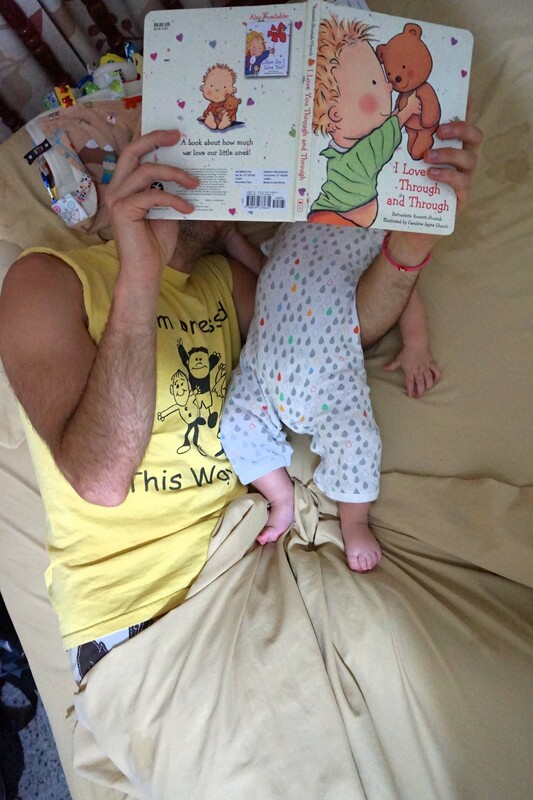 He loves morning reading time. Thanks for the comment! Always good for a laugh.